“Mean people are an excuse to stand up for yourself and show compassion,” I agreed with this on my Twitter feed the other day. It was a day that I was the recipient of a mean remark at work. It’s taken me a while to get over it. I wish I wasn’t so thin-skinned. If you know me IRL (in real life), you know that I am an extremely nice person. Just the other night when I went to see the movie, Take Shelter —which, seriously, inspired a panic attack in me and I had to leave the movie early — I apologized to the person who sat behind me, because my head blocked her view. So that’s how nice I am. I apologize to strangers because I sit in front of them at the movies. After the workplace conversation, which also inspired a panic attack, I thought, “Hmmm, wait a minute! You feel I dissed someone? That’s not me. You want me to feel bad about myself? Hmmm. I don’t want to. I’ve got too much to do today. And feeling bad about myself isn’t on the agenda.” I wanted to agree, because I simply love agreement — being such a fan of my “Yes, And!” training from improv and leadership classes. On my bike ride Saturday, I passed this scene in the Meatpacking District. 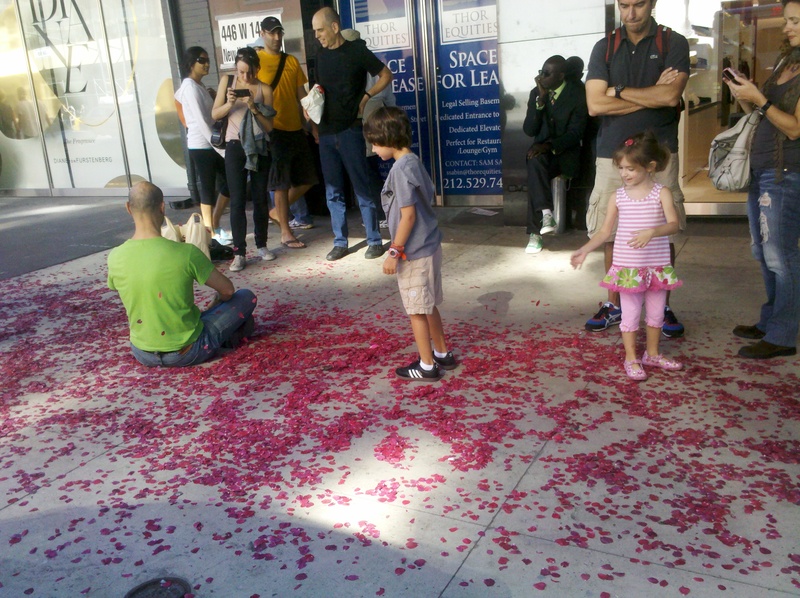 The sidewalk was covered with rose petals. There were enough for everyone. If what we’re agreeing on is that I didn’t do a good enough job, I can’t agree. I did an awesome job. I’m sorry you don’t think so — or you overheard someone who said that I didn’t do my job well enough. So it’s really workplace gossip. Wait. This isn’t about me. It’s about you and that was just mean. Other studies show 70 percent of adults are generous. I believe I am with the majority, looking out for others. If anything, I fail because I want too much to be liked and approved of. I admit taking criticism is not my strength. I like the gold star and the praise — I like to give it and I like to get it. And I like that I am nice. And I really like nice people. I like my friends smart, funny and nice. And if I could only have one of those attributes in a friend, I’ll choose nice. So why are some people mean? Maybe it’s just a mean gene; they’re part of the one-third that won’t share their stickers. That’s just how they roll. As the Twitterverse reminded me, an interaction with a mean person is an opportunity to stand up for yourself, show a little compassion, look within, make any corrections, and ultimately, move on, sharing the stickers. It is not easy. Here’s the Wall Street Journal article: It’s Mine! And this helped me too: Don’t treat unkindness with kindness.